1. 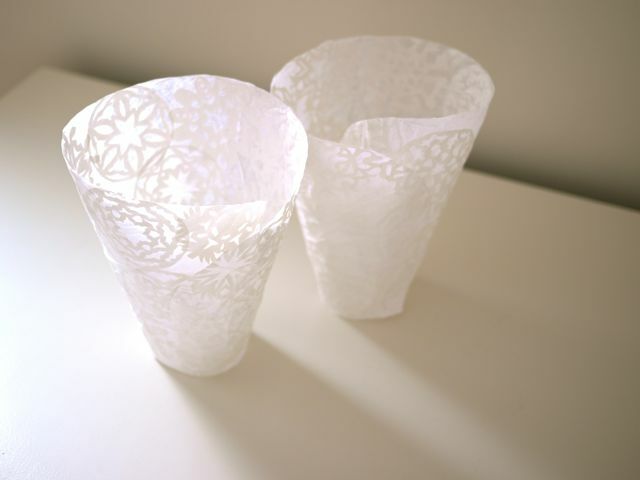 Wrap your small lampshade with plastic wrap. Be sure it is well covered, but NOT too tightly. Tuck the plastic wrap ends inside the lampshade. 2. Water down some Mod Podge in a bowl you care nothing about. The Mod Podge should have the consistency of maple syrup (yummm, maple...). Slather the Mod Podge all over your plastic covered lampshade using a paintbrush. 3. Take a piece of white tissue paper and cover the lampshade. 4. Make sure there aren't any gaps or holes. If there are, cover those too. 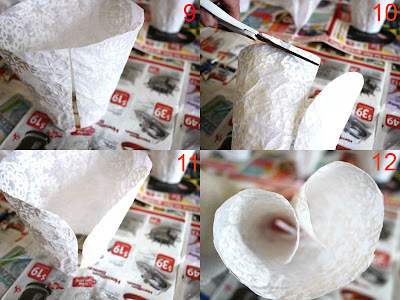 Using your paintbrush, smooth the tissue paper down onto the lampshade. 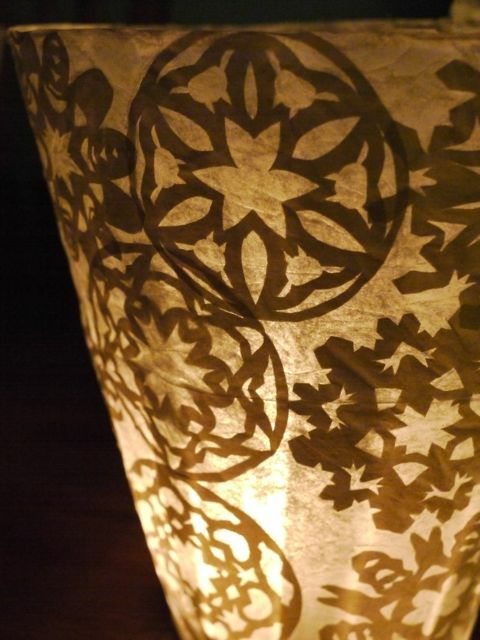 There will be creasing and crinkling of the tissue paper, but that adds to the charm of the lantern. 5. Using the white wrapping paper, cut out a ton of snowflakes. You will be covering the shade with the snowflakes, so you'll have to estimate how many your particular lampshade will require. 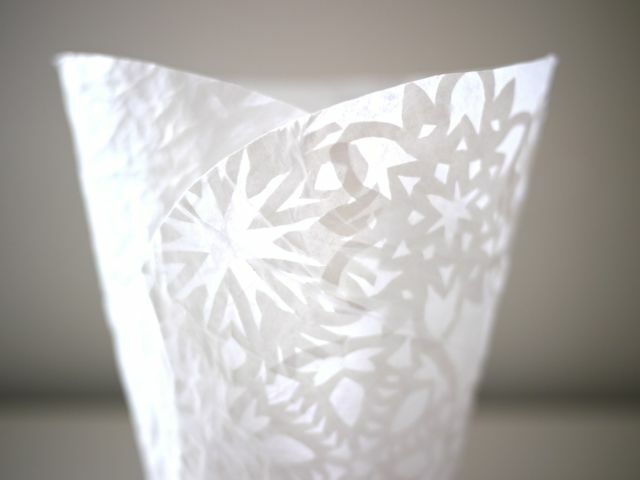 I cut out approximately 20 - 3 inch (7.5 cm) snowflakes for my lampshade. 6. Apply the runny Mod Podge on the tissue layer. Apply the snowflakes on the shade, going over the snowflakes with your Mod Podgy paintbrush. 7. Cover the entire shade with snowflakes. Give the shade a few minutes to dry out a little. 8. Apply another coat of Mod Podge over the entire snowflake layer. 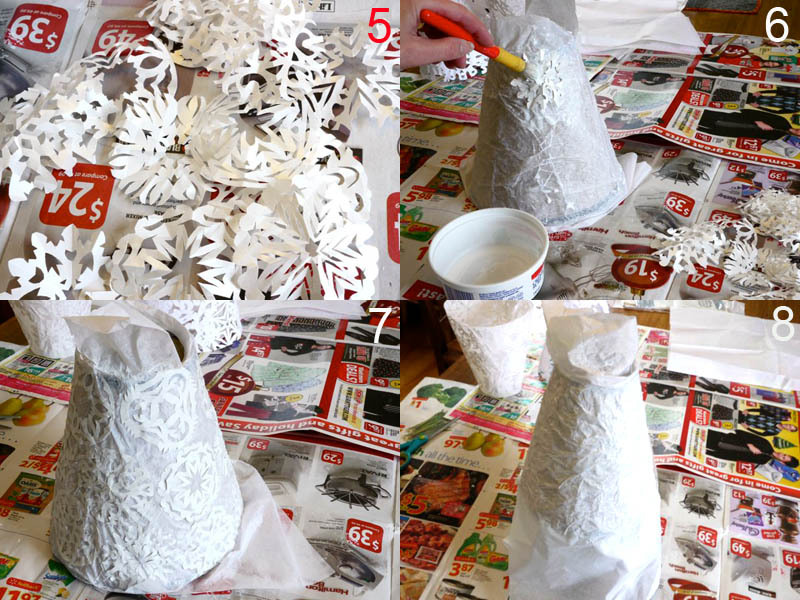 Take a second layer of tissue paper and place it over the snowflake layer. Once again, using your paintbrush, smooth the tissue paper down onto the lampshade. Allow the whole thing to dry well. 9. 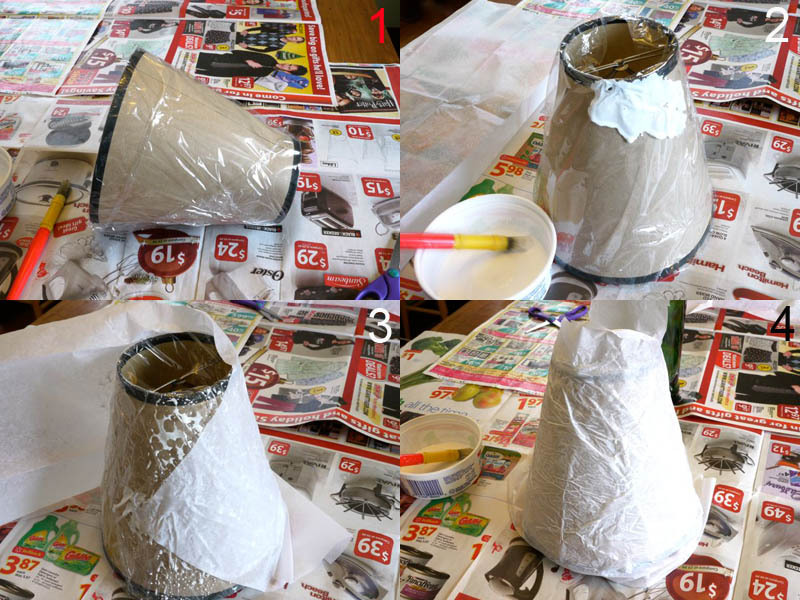 Once it is dry, remove the paper lantern from the lampshade. 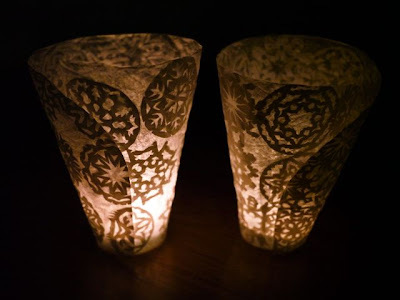 To do this, make a slit down one side of your lantern with an exacto knife. Don't cut through the lampshade. Untuck the plastic wrap ends. Gently remove the paper lantern. Carefully peal away the plastic wrap from the paper lantern. The plastic wrap should come off fairly easily. No struggle required. Trim the top and bottom edges of your lantern as in #9. 10. For a calla lily look, cut away the top corners of the lantern along a curve. 11. Your lantern should look as mine does in #11. 12. Gently curl the sides in by rolling them inward with your hands. You are done! And you have your very own Winter Wonderlantern!!! Please be SAFE! Always put your candles in glass votives or jars before placing them in the lanterns. Now if you like this snowflake craft, you will be awestruck when you see this Wonderland by Aunt Peaches, one of my favourite bloggy voices and crafters! And if you haven't seen it yet, get a load of Lupin's Snowflake Curtain. Isn't it spectacular? If I had the time, I'd put one in every window! So so pretty! These are so pretty! And I love that I have everything on hand right now to make them!!! gorgeous, and super creative title! love that! Would love to use this technique on a full out, year-round lamp shade. A big one too! Maybe the snowflakes are watercolored yellow/orange first. Tangent --One time I saw snowflakes cut from little kid's marker/scribble drawings...they were sooooooo cool. 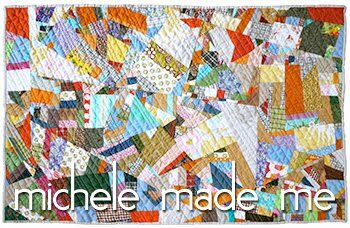 Can you imagine a bunch of those with your tissue glaze binding them together all translucent and fabulous and then the water based markers would run their colors down all drippy and marvelous and....OH MICHELE...here I go, you got me thinking out loud again! I love these!! They are just gorgeous!!! Oh Michele these are simply amazing! 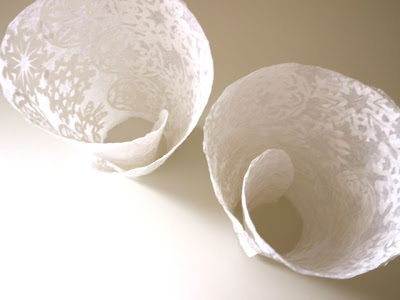 This project is gorgeous and one I think I might be able to achieve (I'm not very good with an x-acto...shakey hands, so I'm intimidated by a lot of the precise cutting paper crafts). When you say 'white wrapping paper' do you mean glossy paper, or is regular printer paper ok? Crazy amazing. I can't believe how cool it looks WITH and WITHOUT a light inside. Two totally separate beautiful things! Never would have come up with this, it's wonderful, I'm borrowing this idea soon. The things you do with white. The calla lillies are in bloom! I really love how the light shines through in the first photo - magical. oooo they would look fantastic in the garden at night (it's now BBQ time in Oz)...stunning work as ever Michele! these are so beautiful. One of the best Christmas crafts I've seen this year. These snowflake lanterns are just spectacular! They set such a magical mood. These are gorgeous! I may have to take a stab at it... they're so pretty and simple. If you get a chance later today, I'd love for you to stop by to link up to my Not "Baaad" blog hop! These are really pretty! Great idea! I absolutely ADORE these! I want to make them so bad! I was wondering if you would be so kind as to link them up to our 12 Dyas of Christmas Show-Off? Love how these look Michelle! Awesome. You did such a fantastic job. I love these and they are so pretty! Wonderful and awesome, like all of your ideas :). Oh,what a brilliant lantern!! !THANKS A MILLION MICHELE!! !